Here is a mani I wore earlier this week. My base is one coat of OPI DS Fantasy, I then applied sections of three flakies polishes, the first is blue at the top, then green and then yellow. The flakie polishes I used were Inglot 203, 204 and 205. Then I decided to make it matte, because flakies look awesome matte. The Inglot flakie polishes are packed with flakies, which is good, cause the bottles are tiny. This was just one dabbled layer of each of the Inglot polishes. I never remember to matte any polishes. I must try to remember to do it more often. I particularly like the soft touch feel that matte polishes give. That is gorgeous! 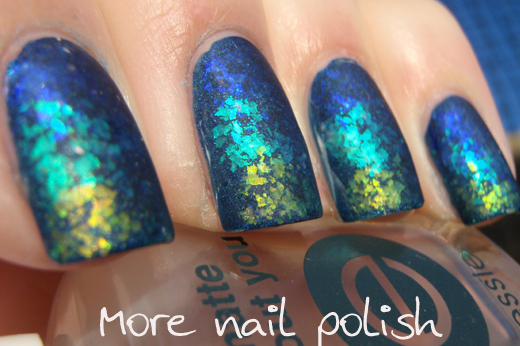 Reminds me of fish scales, amazing! Absolutely stunning. I must try this! Holy. Crap. This is completely beautiful. I love these flakies. It doesn't look like these polishes are easy to come by here in the U.S.. Any advice? They are available on the Inglot website and at really large Macy's. 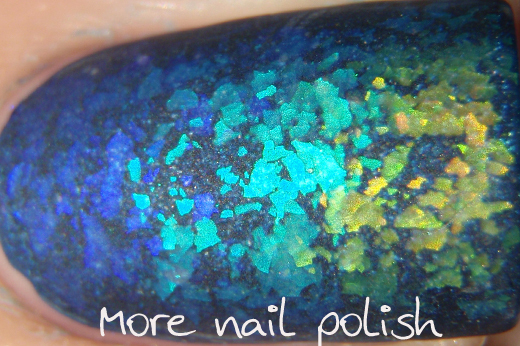 Also, there are plenty of other flakie polishes available in the US market. There's an Inglot store in Newport Beach, California at Fashion Island. Mass market: you might want to start with Essie in Shine of the times, available at CVS and WalMart for example, or Revlon has a few out right now that are double ended with a base color on one end and a flakie coat on the other. Sally Beauty Supply has a few flakies. The prettiest ones I've seen are online in various Etsy stores. That is so cool! I have one of the Inglot flakies, now I wish I had picked up more! Flakies should always be reused matte for a second mani! I love your blog! Absouloutely me favorite beauty blog! I love that polishes you have! All of them are so cool and chic! I love all the glitter! FABULOUS, truly! Great idea and choices with beautiful results. 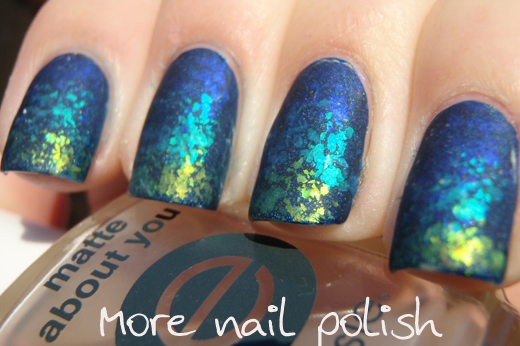 Thanks for sharing this mani. 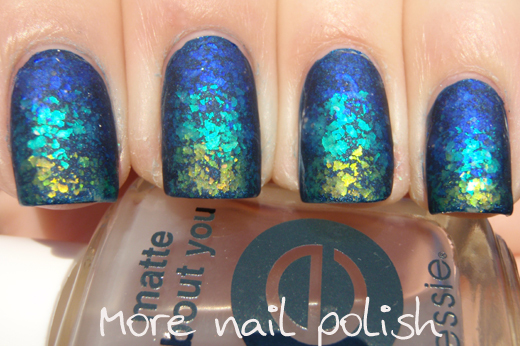 There are not many swatches of Inglot flakies out there, so not many nail fanatics know how awesome they are! These looks adorable. Excellent idea to do a flakies gradient. What a gorgeous use of a variety of techniques and finishes! This is soooo gorgeous!! It looks like end of a sunset on your nails! 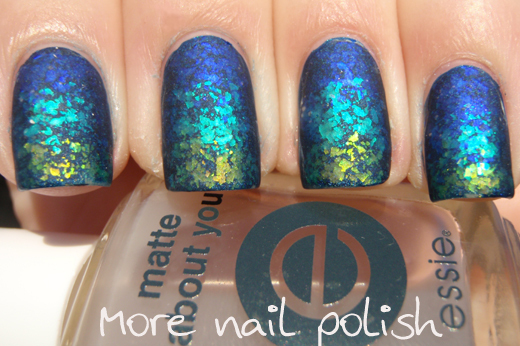 So pretty and I love it with the matte topcoat-- it almost looks like a painting! So pretty! Lovely flaky gradient - like to have seen it with a shinny topper as well too. Love this so much. Inglot flakies for the win!!!! And of course all thanks to you!! Gorgeous! Can't wait to try this!